This one(coral cache) is a bit of a head slapper, but I thought it might come in handy. Laptop (or usb) serial ports are pretty notorious for being stingy on power output. [Roberto] came up with a clever solution. He used a MAX205 (sort of a double+ MAX232) and a singe capacitor to convert the low power serial connection on his laptop to a TTL signal and back again to RS-232. 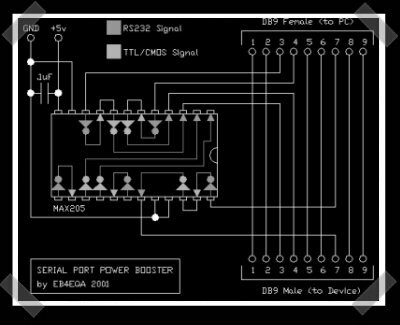 The result is a simple dongle that needs 5v and gives you a high power serial port for those power hungry devices – like [Roberto]’s PIC programmer. I need one of these for my pic programmer too. I agree, there’s really not much of a reason to use the max205/203 here. The only reason for Maxim integrating the caps is more to reduce the board space used, and I don’t see this power booster as having portable requirements. I think calling this a “power booster” is a bit of a misnomer. As I understand, the problem with using portable programmers is not so much the lack of power but the lack of voltage–you need to boost those roughly-ttl level signals from the usb-rs232 adapters to rs232 levels. Now all we need is a current limited/fused molex connector for the rear-of-case and we can feed all our amp’ed gadgets. I’ve been toying around with the idea to get rid of those USB power overcurrent/spike issues. Of course someone should make a laptop release as well for the mobile toolkits.